Such statements, which conform to the position of the majority among the international community, have regularly been voiced from Ankara. The contrary would be surprising actually. The same characteristic can be attributed to statements Turkey issues regarding the Crimean Tatars, which would surface after the Turkic Crimean Tatars made statements and demands; to note, the community of the Crimean Tatars does enjoy a significant political influence. By the way, some believe Minister Davutoglu is closely related to this ethnic group, while others consider him as its part. After all, this statesman was most actively against the new affiliation of Crimea with Russia and was most active in support of the Crimean Tatars. For such moves, a number of Russian experts named him a supporter of the “completely crashed ideology of neo-Osmanism,” allegedly using the Crimean Tatars card for their own interests. A most significant statement by the Crimean Tatar diaspora in Turkey was issued in June in connection with the 70th anniversary of the deportation of the Crimean Tatars. The statement reads in part that the annexation of Crimea by Russia is “a fact of ignorantly mixing international law with dirt” and condemns “attempts to neutralize or eliminate the representative body of the Crimean Tatars” (a local parliament). It is absolutely clear that the official Ankara, along with many other capitals, would never recognize the annexation of Crimea no matter how many “referenda” or “elections” take place to that effect. Furthermore, they will continuously issue statements in support of the Crimean Tatars because Turkey is a traditional, one could even say, “historical patron” of this miserable nation. Meanwhile, people expected more realistic and effective support and protection of their “fosterlings.” After all, seldom exotic discussions on some Turkish mass media about an alleged “opportunity to unite” Crimea with Turkey cannot be considered a realistic support. Indeed, Ankara did condemn the “pull away” of Crimea from Ukraine; Ankara does allow the NATO to sail its ships into the Black Sea and welcomes the leaders of the Crimean Tatars. However, it is not a party to the sanctions against Russia, nor is it going to be. 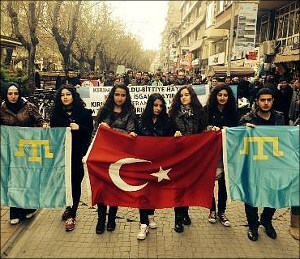 With this backdrop, the Turkish support of the Crimean Tatars looks bleak and unconvincing. Moreover, back in spring, Erdogan said of his phone conversation with Russian President Vladimir Putin: “I told him that Russia must protect the rights of the Crimean Tatars as it does with [the rights of] the Russian majority and other [ethnic] minorities on the Crimean [Peninsula].” It is difficult to argue against the dubiousness of the statement. Mr. Gul noted that “despite certain ‘stumbling blocks’ on the way of Turkey’s path to reconsider its position to the status of Crimea,” Turkish-Russian ties enjoy significant potential in general terms. He pointed out the special relations Recep Erdogan and Vladimir Putin have, and empathized “the similarities in their political charisma.” If one considers Syria, Iraq, the issue of the Kurds, problems of opposition and alleged corruption, Ankara certainly has no room for another problem in the form of disputes with Russia over Crimea and the Crimean Tatars. The issue at hand is well-known: On September 16, the Mejlis building in Simferopol was searched for 12 hours. Protocols of several sessions, religious books, CPUs and hard drives as well as Mustafa Cemilev’s personal belongings were seized. Mr. Cemilev is banned from returning to the peninsula. Later, Deputy Prime Minister of Crimea Ruslan Balbek clarified that the investigation bodies are not probing the Mejlis itself, but exclusively the fact that the Mejlis building is Mr. Cemilev’s property. Just imagine, Mr. Cemilev is still a member of the Ukrainian parliament! What a horror! Mr. Balbek empathized that the Crimean Tatars “continue actively integrating into the Russian society.” However, the real reason behind the search appears to be something else: the Crimean Tatars boycotted en mass, joined by others, the recent elections; mainly, information circulated by several local leaders, including Rifat Chubarov about the “real” voter turnout of less than 50% was the main catalyst for the boycott. Apparently, a successful “integration” of the Crimean Tatars will continue “progressing” in the form of exiles, searches and arrests along with labeling all those arrested as religious extremists.